Amagon, known in Japan as Totsuzen! Machoman (突然! マッチョマン, lit. Suddenly! Machoman? ), is a side-scrolling platform action game for the NES developed by Aicom. It was published by Vic Tokai and Sammy Corporation in 1988 and 1989. Amagon encounters a variety of enemies which he can dispose of with his rifle. He also has the ability (upon collecting and then activating the Mega-Key) to transform in to a larger, stronger version of himself called "Megagon". Upon transformation, Megagon is given 1 hit point for every 5,000 points he scored as Amagon (whereas a single hit from any enemy or hazard will kill Amagon). Megagon cannot use the machine gun, but in its stead has a punch which does eight times the damage and never runs out of ammo. At the cost of one hit point each, he can also fire waves of energy from his chest; these are much broader than machine gun shots, do 16 times the damage, and can hit multiple enemies in a single blast. The last boss in the game is based on the Flatwoods monster, a supposed space alien seen in Flatwoods, West Virginia on September 12, 1952. Players take the role of Amagon, a Marine who is trapped on an island after his plane crashed. Inconveniently, his rescue ship is on the other side of the island, which Amagon must now cross on foot. The storyline written in for the original Japanese release was somewhat different. 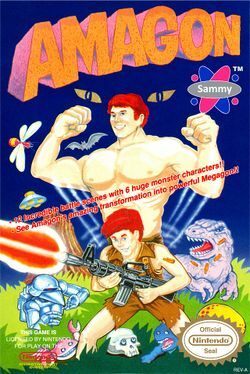 The main character is a scientist named "Jackson", who transforms into his "Macho Man" form, using the special drug "Macho Max" that has been taken from his plane, by the creatures of "Monster Island". This page was last edited on 7 April 2015, at 23:57.